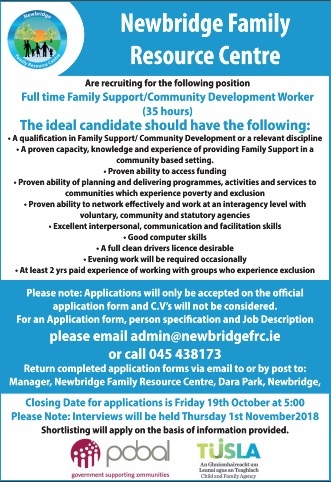 Newbridge Family Resource Centre are recruiting a full-time Family Support/Community Development Worker. Applications must be made on an official application form, which can be obtained from admin@newbridgefrc.ie or by calling 045 438173. The closing date for applications is Friday, October 19. For more information on the position, including how to apply, please see below.